In Play On! 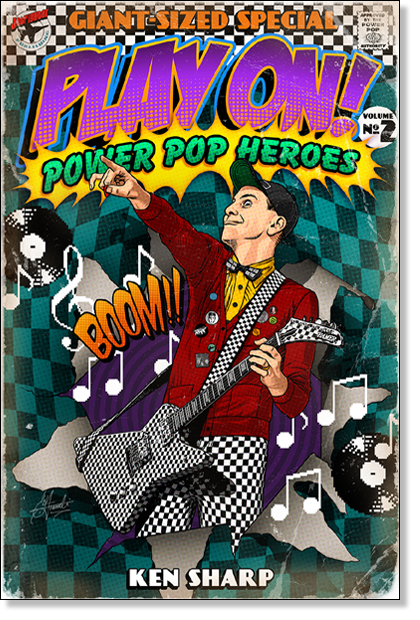 Power Pop Heroes: Volume Two (Jetfighter/$45), the second installment of a three-volume series, Ken Sharp honors the musical innovators who built the genre’s foundation. Featuring a foreword by Rick Springfield and afterword by Cyril Jordan of the Flamin’ Groovies, the 750+ page book culls exclusive extended interviews with 23 artists that defined the genre and is profusely illustrated with rare photographs and original handwritten lyrics. Argy Bargy (Squeeze,) Working Class Dog (Rick Springfield), Shades in Bed and Crashes (The Records), Present Tense and Tongue Twister (Shoes) , Union Jacks (The Babys), Pezband (Pezband) No More, No Less (Blue Ash), The Rubinoos, Back to the Drawing Board, and Basement Tapes (The Rubinoos) and Elevator (Bay City Rollers) plus select artist commentary about classic recordings from members of Cheap Trick, XTC, Sweet, Utopia, Flamin’ Groovies, Dwight Twilley and others add to the inside story of this influential genre.